Looks like Apple will be adding a new "Find My Friends" feature to its MobileMe service in the not too distant future. The settings pictured above were unearthed in the latest iOS 4.3 developer build that's already yielding a healthy list of new devices and functionality including in-app AirPlay video support, a carrier-dependent personal WiFi hotspot, the return of the physical orientation lock switch, and a host of new multitouch gestures. Presumably Find My Friends will offer functionality akin to the free Google Latitude app doing little to justify Apple's $99 MobileMe annual cost. Update: Remember Apple's iGroups location-based social networking patent application? We just did. 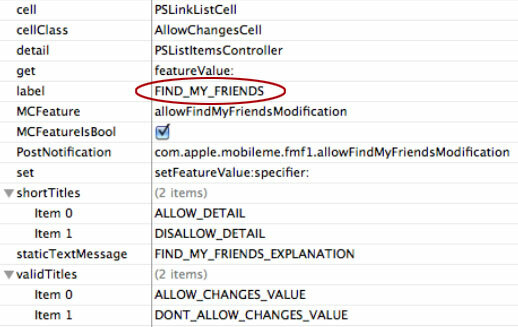 'Find my Friends' MobileMe feature revealed in iOS 4.3 developer build originally appeared on Engadget on Thu, 13 Jan 2011 03:52:00 EDT. Please see our terms for use of feeds.